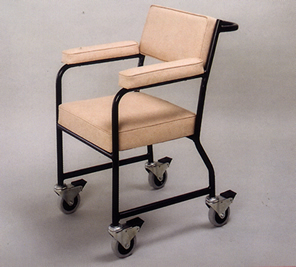 This is a lightweight chair manufactured for general use within the hospital or home when ease of manoeuvrability is essential. Although constructed for lightness the fully welded rigid frame is well able to withstand years of rough handling. Castors are fitted all round, and can be supplied with a foot brake as an extra if required (as illustration).